He said, she said… who is lying? Just last week, Michael Harris posted an article about the recent changes to Publication Review Committee Procedures for the Department of Fisheries and Oceans Canada. These procedures deal with the steps that departmental staff need to do in order to submit and publish their work in scientific articles. The e-mail noted that the procedures were to take effect February 1st, 2013. So, the communications advisor says there’s been no changes, but I have an e-mail from my administrators detailing the changes, and indicating when the changes would take effect. You decide who’s being untruthful. 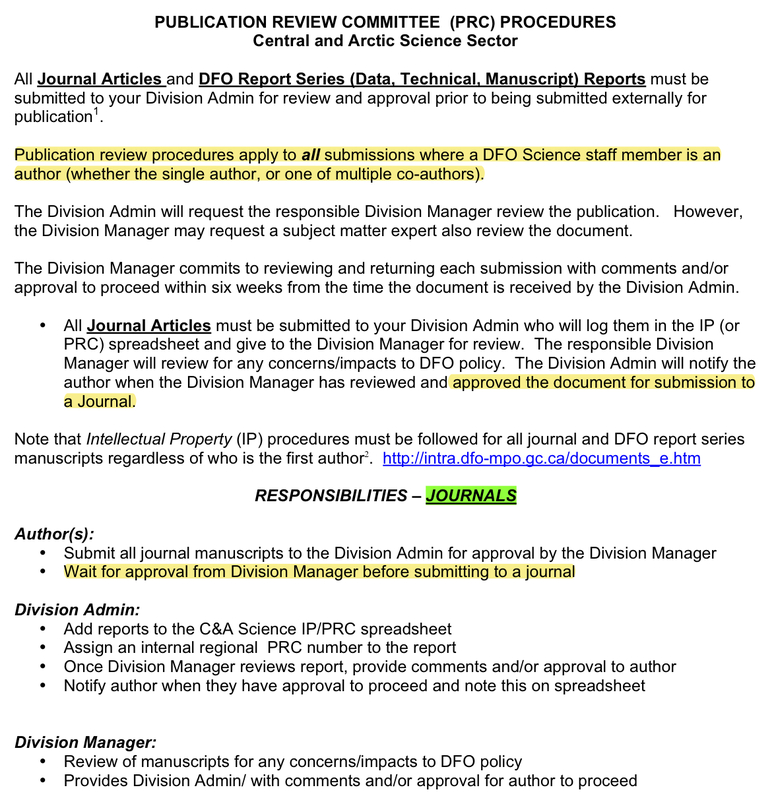 1. Review procedures used to only apply to publications where the first author was a DFO scientist. 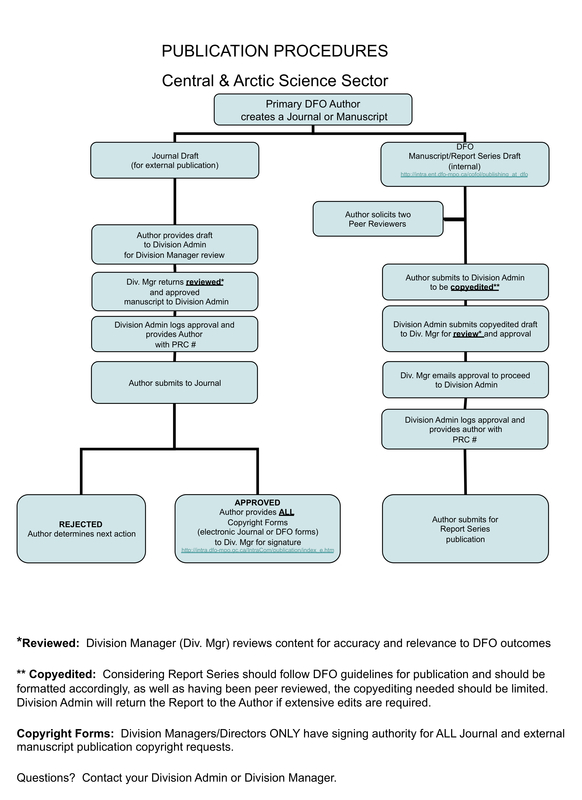 Now, it applies to any paper with a DFO scientist on it, first or co-author. 2. This is maybe the most important point: the author of the paper no longer signs off on the copyright on behalf of the crown (sidebar: because the work is done as part of the Government of Canada, the Crown owns the copyright- similar situations apply to government science around the world- the issue is not copyright ownership, but who actually signs off on it). This is a problem because it gives someone who has had no role in contributing to the work in the paper or the science conducted as part of the publication the ability to keep the paper from publication by refusing to sign the release form. This also assumes that the same manager “approved” the paper for submission and review at a scientific journal in the first place. The only possible way out of this mess is that the DFO scientist involved in the paper pulls out and leaves it to an academic co-author to publish- even if that means giving up first authorship (e.g., the guy who wrote the paper no longer even appears as a contributor to the work), and assuming that you have an academic co-author (note: from this point forward, I will ALWAYS have an academic co-author). That assumes, of course, that the government scientist somehow managed to get permission to do the work in the first place. All of this acts to weaken the contributions of government scientists moving forward. UPDATE: Feb. 14th: According to Margaret Munro, who has thoughtfully commented on this post below (as well as written a related story that’s all over the place at the moment), DFO’s tune is changing since Harris’ original article. Apparently, Assistant Deputy Minister Kevin Stringer has now admitted that the publication procedure has changed. Hope to hear more about this angle soon. This entry was posted in Canada, DFO, Fisheries and Oceans Canada, Science and tagged author, co-author, copyright, policy, supression, university by unmuzsci. Bookmark the permalink. The DFO, has a lot to answer for and explain, to Canada and Canadians.. and one assumes to other countries that may import our fish, whether wild or farmed, infected or not. Muzzling, funding cuts, obstruction, deceit, denial.. threateningn audits flowing from the Prime Minister’s Office, downstream through Keith Ashfield and now Ms Shea.. seem to mingle with almost identical damaging processes within the Environment Ministry, Agriculture (farmed fish) and Food Safety.. not to mention how Natural Resources seems to always be involved within the disturbing and dangerous corporatist matrix. The ludicrous statement from Stephen Harper recently, in Vancouver regarding the Kitsilano Life Guard Station is a dispiriting example of just how stupid the Prime Minister thinks Canadians are. One can hardly wait for his wisdom on the science of salmon, marine biology or criteria of polluted waters. ‘paramouncy’ ??? “The paramouncy of government resources in this area is on public safety and the government is allocating its resources in a way that we believe, based on the advice we have received from the coast guard, that is best in terms of public safety,” the prime minister said. One assumes the Coast Guard advised the government to close the Kitsilano station. Really ? The busiest station in Canada.. just close it… Bye bye .. ! I look forward to Stephen Harper also explaining to Canada and Canadians that DFO scientists and the ministry.. advised the government to muzzle, deter, obstruct, suppress and defund science ASAP on behalf of Jobs, the Economy and Good Government. You raise an interesting point at the end of your comment regarding science advice- ultimately whatever DFO comes out with in their new and revisioned Fisheries Act with regards to implementation will be touted as having been informed by science; yes, scientists internally are being asked to contribute to the new policies and the technicalities of their implementation. An old saying comes to mind with this process; “You can’t make a purse out of a pig’s ear”. That is, yes, the government will be able to say that whatever emerges will have been informed by consultation with scientists (internally, not externally, e.g., academics), but the limits on what you can provide that advice on are so restricted and inherently policy-driven, it makes it nearly impossible to do anything meaningful. No matter how much they try to dress this up at the end of the day and try to legitimize it with participation from science, these changes are policy-driven from the start. I thought I was wrong but revisted the transcripts of Question Period of the other day: not once but twice the Minister said the DFO policy had not changed regarding policy towards scientists. Economics depends on the air we breathe, the water we drink, the food we eat. It is inside and not outside of all that. I recall one of the not so honourable members saying about climate change and its affects on us, well humans will adapt. I am not adapting; my human body cannot adapt to it or is there a borg like future for us all? Too many robot mans in the House already. Excellent disclosure here for us out here; how on earth do they reconcile what the Boss is saying and what this and others write and then are told, it is lies. Yes indeed we can see now where the mists of untruth are gathering. That would at least get them out in public, and may avoid the current roadblocks. Fantastic suggestion- I really have no idea how management would respond, or whether anyone’s actually tried something like this yet, but arXiv could be the workaround no one is currently thinking about. There are, of course, still the throttles on getting external funding in the first place, but may help to circumvent the process around publication. UPDATE: actually, I think I have my response re: ArXiv. Margaret Munro now has an article running in papers across the country indicating that DFO is now stating that everything that’s part of any collaborative endeavour with external scientists is confidential until both parties sign off on it. The example given is a collaborative scientist that, under the revised agreement, can’t even blog about the work with DFO without some complicated approval process. It’s clear now that this now goes beyond just signing copyright release- it’s putting in place the ability to limit ANY communication around the science generated by government, with or without external collaboration. The future is… scary. I’m a fan of your blog. Here’s a follow-up story, prompted in part by your recent post. http://www.thestarphoenix.com/news/national/Scientist+calls+confidentiality+rules+Arctic+project/7960894/story.html ADM Kevin Stringer acknowledged in an Interview yesterday that here are “adjustments” being made to the publication procedure, which will apply across the department.. Thanks Margaret! I actually came across your story last night, which prompted me to update a reply on a previous comment here- Colton Byrnes had suggested the use of ArXiv as a means of reporting government science in a venue that doesn’t require copyright release. These rules in the collective agreement between DFO and the external researcher in your paper, however, suggests that even this wouldn’t fly, given the wording that the data and activities remain confidential without approval of all parties. Thanks again for bringing attention to this matter.